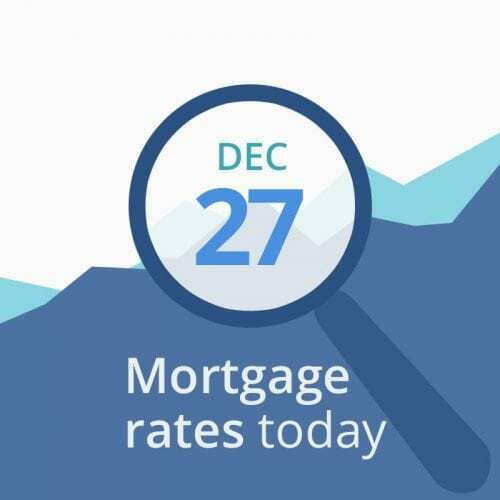 Average mortgage rates today are unchanged as lenders digest the reversal of yesterday’s stunning stock surge. Bargain hunting is over for investors. Expect mortgage rates to fall as the day continues. New home sales for November (predicted: 568,000) does have an economic impact but not a big one. More than expected is bad for rates, fewer is good. But the report has been delayed this morning. Most major numbers reversed their courses and point to falling rates. Today’s data point to lower mortgage rates, but markets are unstable. You can probably float a day or so if that will get you into a better tier (for instance, drop from a 45-day lock to a 30-day, or a 30-day into a 15-day lock). If closing soon, current rates are attractive enough to feel good about. This week is holiday-shortened due to the Christmas holiday. Expect light trading and few reports.